The sense of foreboding that surrounded Leicester City after they sent eyebrows everywhere skywards by replacing Nigel Pearson with Claudio Ranieri during a difficult summer has been blasted away by a team whose desire to prove a point has brought them six from their first two matches. They played chests-out football at Upton Park and this victory over West Ham United owed as much to their quality in attack as it did to their defensive resolve and togetherness. Shinji Okazaki and Riyad Mahrez scored the goals in the first half, while Wes Morgan and Robert Huth stood firm in the heart of Leicester�s defence when West Ham woke up in the second half and threatened to steal an undeserved point. Relegation? If Leicester continue to perform with this much cohesion, spirit and belief, they will challenge for a place in the top half. Ranieri, though, refused to get carried away. First appearances can be deceiving. Just look at West Ham. Hailed after last Sunday�s win at Arsenal, here was a reminder that they remain a work in progress under Slaven Bilic. Asked to seize the initiative and take the game to Leicester, Bilic�s players were worryingly short of ideas and West Ham would be kidding themselves if they think that they do not need to sign another striker and add more incision to their midfield. They were too reliant on Dimitri Payet, allowing Leicester to focus on snuffing out the Frenchman�s threat, and ended the game with 10 men when Adrián was sent off in stoppage time for a reckless foul on Jamie Vardy. The West Ham goalkeeper could have no complaints after poleaxing the Leicester striker. The early signs were promising for West Ham when Kasper Schmeichel flapped at Payet�s free-kick and was relieved to see Reece Oxford�s header clip the top of the bar in the second minute. Yet West Ham�s fast start created a false impression. They were narrow and one-paced, while it was not entirely surprising that Oxford struggled to replicate his performance against Arsenal. Pedro Obiang replaced the 16-year-old at half-time. West Ham played in front of Leicester and the congestion in the middle meant that Payet was suffocated behind Diafra Sakho and the lightweight Mauro Zárate. When Sakho did beat the offside trap just before half-time, he was frustrated by Anthony Taylor�s refusal to award a penalty for what West Ham argued was a clear denial of a goalscoring opportunity by Schmeichel. Leicester were far more balanced in attack. Vardy�s non-stop hustle earned him a booking for an early foul on Adrián, but it was an effective complement to Okazaki�s nimble movement and it was not a surprise when the latter gave Leicester the lead in the 27th minute. Vardy, who was disciplined by Leicester last week for abusing a fellow gambler in a casino, broke down the left and although Adrián showed wonderful reactions to save from Okazaki, the ball looped into the air and the Japanese striker helped himself to his first goal in English football with the simplest of headers from a yard out. Okazaki scored 29 goals in 70 games for Mainz. �Shinji smells his way around the box,� Ranieri commented later. 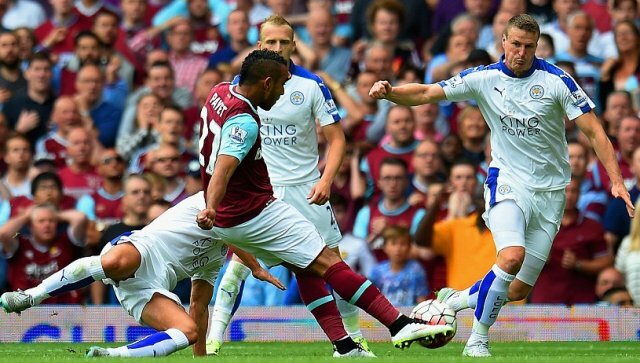 Leicester were rampant, West Ham were ragged. Okazaki and Vardy ripped them apart on the left again 11 minutes later and Mahrez scored his third goal of the season, thumping the ball past Adrián with his left foot. Obiang�s introduction steadied West Ham�s midfield and Payet pulled a goal back in the 55th minute. Cheikhou Kouyaté found him and he swept a wicked shot high to Schmeichel�s right. The volume rose and Leicester wobbled. Sakho headed straight at Schmeichel from close range. Sensing that defensive reinforcements were needed, Ranieri took off Okazaki and bolstered his midfield by sending on N�Golo Kanté. West Ham were also targeting Ritchie De Laet and Ranieri replaced the right-back with Yohan Benalouane. Apart from a late chance for Sakho, whose snapshot was saved by Schmeichel, Leicester were comfortable. The Tinkerman�s tinkering paid off.